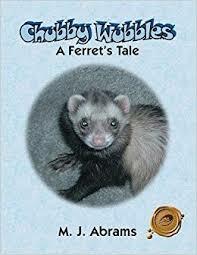 A delightful story about the adventures of a young man and a mischievous ferret awaits in Chubby Wubbles! This vibrant picture book tells a compelling story about the bond that develops between them. As the story unfolds, their loneliness leads to a fateful meeting and a growing friendship. Together they embark on an exciting journey that progresses with lots of humor, fun, and unexpected drama along the way. Chubby Wubbles will warm the hearts of children everywhere! Working with kids has really helped my perspective change on what they may or may not find enjoyable. And I have to say I wish I had this book in print because it is so engaging and something I think they would love to see. The bond that develops between the boy and Chubby Wubbles is great, and something I think will teach a lesson to people young and old. After being an observer and non-pet owner, I was thrown into the mix because my son was leaving and I couldn’t bear the thought of him having to give up his pet ferret to someone else. Since I’ve grown so attached to this lovable critter, I agreed to take care of him while he was away. Because of the many experiences my son has had with this adorably sweet animal, I decided to write a children’s book based on a true story about their adventures and misadventures.